Playdead really caught our eye back at PAX East, and we just got some great news from them. 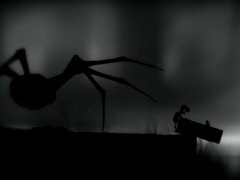 They’ve got a new site and a new trailer for their unique indie game, Limbo, as well as a way that you can help see more of this creepy and atmospheric title. Read On for more! The new website is http://www.limbogame.org. Click over there and you’ll see a video showing off some footage of some new areas of the game, including a decidedly urban looking rooftop. Considering most of what we saw in the demo we were able to play, as well as most of the material previously available, had a wilderness feel, this has got us really excited. It speaks of an even greater depth and variety than we’d expected. If you drop by the site and decide you’d like to see and learn more, then good news! Gametrailers, along with posting some new footage of their own, is running a contest that lets you choose what will be featured on Gametrailers TV. If you want to see more eerie, monochrome landscapes and horrifying insectoid silhouettes, then make sure you cast your vote. And if this only whets your appetite, then check out our Interview and Preview from PAX East for more info.